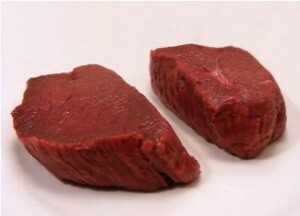 Deer steaks or venison are nearly indistinguishable from other forms of red meat. Photo from Wikipedia Commons. On December 21st 2011, the Ontario Federation of Anglers and Hunters tweeted a link to a National Post article, “Wild Game Meat not Welcome at Ontario Food Banks,” which reported that a Lanark, Ontario food bank had decided to reject donations of wild game meat. The post piqued my interest for several reasons. First, while the economy has improved since the onset of the recession three years ago, data reveals that food bank usage is still high. Food Banks Canada recently released a report entitled “Hunger Count 2011” in which it revealed that 700,000 Canadians – roughly 2% of our population – rely on food banks every month. The holidays can be a particular stressful and trying time for families and individuals in need, so the timing of the food bank’s decision was curious. Second, as an environmental historian and an avid hunter, the issue raises some intriguing concerns for me about how our society views the consumption of wild game meat. The Lanark decision was backed by Food Banks Canada, which had recommended that Ontario food banks should reject any meat neither raised in captivity nor killed in a provincially-licensed abattoir. However, in previous years, groups such as the Safari Club International have donated deer steaks and ground venison during the holiday season. While club members kill the animals, the meat is always cut, wrapped and frozen by a provincially licensed butcher. This was the first time a food bank rejected the Safari Club’s donation. Opponents of the decision argue that wild game meat is the most organic meat available to Canadians. Provincial legislation dictates that individuals cannot distribute meat unless the animal was killed and processed in a government-licensed abattoir. Yet, in years past, Ontario food banks have turned a blind eye to the legislation and openly accepted the donations. The Lanark decision marks a departure from other provincial food banks in Saskatchewan, Alberta, and British Columbia, many of which actively campaign for donations of wild game. On the other side of the border, naturalist Jackson Landers of Virginia has suggested that Canada geese in New York should be hunted in order to control the population and help feed the poor. He began to push this idea after New York City officials in 2010 rounded up 150,000 geese, poisoned them and dumped the carcasses in a landfill as a population control measure. Imagine how many tables these geese would have enriched; instead, these animals were treated like garbage. Historically, Canada is a country that was built on the consumption of wild meat. Subsistence hunting has been an integral part of First Nations culture, but it was also significant for our nation’s European settlers. When domestic meat products were unavailable, game meat served as an alternative protein source that was both readily available and easily transportable. With the development of the railway and more advanced refrigeration techniques since the late nineteenth century, many Canadians began to consume less wild game meat, although it was still significant to many communities and groups across the country. As historian Gerald Killan has demonstrated, wild game meat continued to be important during times of crisis. During World War I, the Superintendent of Algonquin Provincial Park, George W. Bartlett, arranged to have a significant number of deer culled from the park in order to alleviate the wartime meat shortage. While certain methods of hunting have come under scrutiny in recent years – most notably the cancellation of the Ontario spring bear hunt in 1999 – statistics show that hunting is on the rise with younger generations. Nonetheless, many Canadians are still against the sport and its obvious by-product, wild game meat. As the sole hunter in my family, I experienced this type of opposition following my first successful duck-hunting trip on Manitoulin Island in fall 2009. After bringing the duck in one night from the barbecue while the rest of my family dined on an alternative dish, my parents and sister were repulsed by what was on my plate. Not only did they believe the duck was emanating an offensive odour, but they were also put off by the reality that I had killed and butchered the birds myself. My family held no qualms with the process that their poultry had gone through to arrive in our household. I tried to convince them that they were missing out on an opportunity to consume fresh and organic meat, but my efforts were dashed as they all staunchly refused to sample my cuisine. Today where the pitfalls of genetically modified food are readily accessible and the mistreatment of farm animals are well documented, it is no wonder that organic food is increasing in popularity. For example, this past summer, some of my colleagues from York University produced a video for the Network in Canadian History and Environment (NiCHE) that detailed their efforts in butchering four lambs acquired from Kawartha Ecological Growers. As my family’s refusal of my dinner offerings illustrates, many people still do not connect wild game meat as organic. My dissertation chronicles the history of black bear hunting and management practices in Ontario. Yet I believe that I also have a duty as an environmental historian to educate the public on the benefits of safe and careful hunting. Responses to the National Post article ranged from insightful to misguided. Some believed that the Lanark decision came from senior government officials eager to continue promoting an anti-gun and anti-hunting agenda. For example, one individual disagreed that wild game meat is more organic than domestically-raised protein, and even suggested that moose and deer contain more mercury and dioxin than their bovine counterparts. To my knowledge, no studies have been undertaken that prove ungulates such as deer contain more toxins than farm animals. But, as game animals are not inspected, wild meat enthusiasts should always be mindful of the parasites and bacteria that these animals could carry. This means that extra care should always be taken to ensure that wild game meat is cooked properly and thoroughly. It is important that we make informed decisions about where our food comes from and how it is processed. While some may disagree with the opinions I hold about the value of subsistence hunting, it is an important part of our heritage. With more and more people making conscious decisions to obtain organic and cruelty-free protein, it is time to start reconsidering the value of wild game meat. This does not necessarily mean that everyone should take up hunting, but Canadians should keep an open mind to the idea of consuming wild game meat, be it duck or venison. Mike Commito is a second-year PhD student at McMaster University. His dissertation, tentatively titled “Orphaned Cubs and Responsible Hunters: Conflicting Values and the Management of Black Bears in Ontario, 1900-2000” focuses on the development of black bear hunting policy and management strategies in Ontario. He is interested in how various groups in the province such as biologists, policy-makers and the lay public viewed bears and how this perspective has changed over time. Thanks for posting this article, Prof. Landry. Without question, it is more than a little inconsistent for folks to decry hunting as cruel, inhumane, barbaric, ets… while eating factory-farmed meat. I have mixed feelings about hunting. As a consumer, I avoid factory-farmed animal produce, which means that I prefer to purchase beef or chicken raised in more humane conditions, OR such things as venison or game meats. That being said, if I understand correctly, a lot of venison or game meat that we purchase commercially is still slaughtered in provincially-licensed abbatoirs. They may live in a wild fashion, but they die like your average cow. Still, that’s a better option than supporting the cruelties of factory farming. At the same time, we need to consider both the socio-economic and environmental dimensions of hunting. While it is true that traditionally, Canada’s aboriginal peoples (and quite a few rural or semi-rural Canadians) have obtained food through hunting and fishing, this is not the reality for urban or suburban Canadians who constitute the vast majority of the population. For your average suburban dweller, hunting and fishing are ways that affluent middle-class folks try to “connect with nature.” (And I’m speaking from the experience of a close relative who lives in the suburbs of the Greater Toronto Area, and takes periodic hunting or fishing trips, typically with other affluent males.) It involves purchasing expensive clothes and equipment and hunting/sporting stores. Then it usually involves driving (in an SUV) some great distance, or flying to some remote hunting/fishing lodge, as part of some tourist package where their food and accommodations are provided. Maybe they succeed in shooting something. (My relative shot a moose, and posed with it for pictures, with his gun.) Then they return to the city or the suburbs, with wild meat and bolstered masculinity. Two observations: first, from an environmental point of view, if most uban dwellers or suburbanites did this, it most certainly would not be environmentally sustainable. And second, my previous observation is a moot point, because for many urban dwellers with a limited income, this is financially impossible. I acknowledge that this is not necessarily true for rural or semi-rural dwellers or those in First Nations communities. And I’m NOT saying that hunting and fishing are wrong. (I live in a northern Ontario city, and we routinely get a lot of wild fish from our neighbour, who does a lot of fishing in the lakes in this area. And as for my relative’s moosemeat, he gave us some. It was delicious.) But I do believe that we need to weigh carefully the environmental costs of different kinds of animal farming (both factory farming and more traditional organic, free-range farming), various kinds of commercial fishing, and the varieties of hunting and fishing (especially factoring in the carbon footprint of travel). For environmentalists concerned about the politics and carbon footprint of our food, these are important questions. As an item of interest, I recently read an article about the mayor of Delray Beach, Florida, who hunts feral pigs and donates the meat to a local soup kitchen. The reason this is something of a surprise is that Delray Beach is by no means a rural community – it’s part of the suburban sprawl of Palm Beach County. But since feral pigs have the potential to do tremendous damage to Florida’s wetlands, hunting them and donating the meat seems to be a reasonable course of action.